Caroline Wagner, an animal imaging specialist, is one of the technicians responsible for imaging veterinary patients. CHAMPAIGN, Ill. — Advances in magnetic resonance imaging have transformed medicine over the last several decades. Unfortunately, this technology is rarely available to veterinarians. 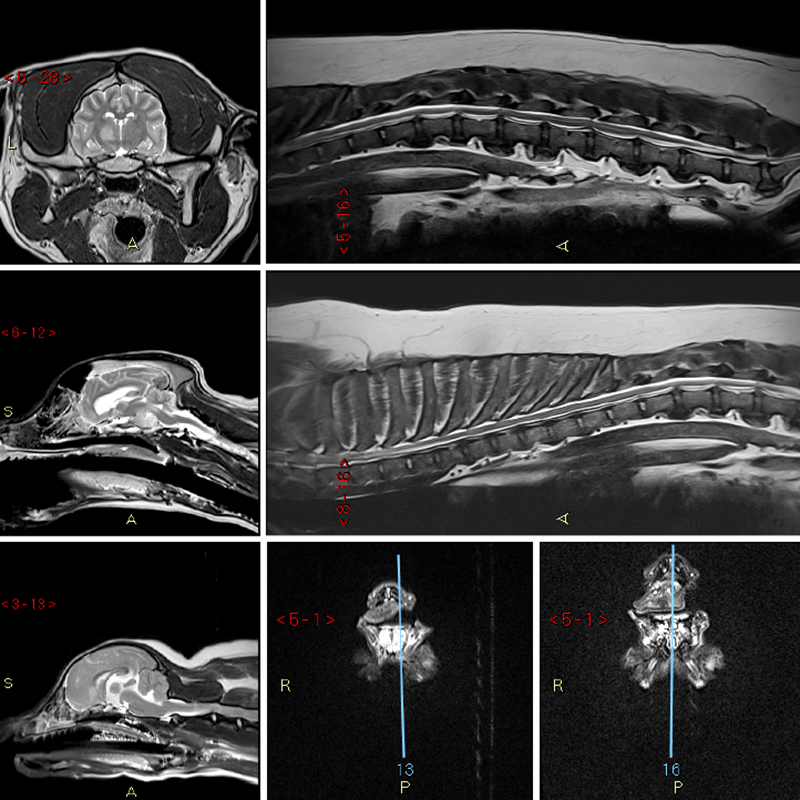 The University of Illinois College of Veterinary Medicine is now one of a few veterinary research and clinical care schools in the U.S. with a state-of-the-art 3-Tesla MRI facility. The recently installed technology can accommodate veterinary patients’ specific needs. It is comparable to the scanner found at the Beckman Institute for Advanced Science and Technology, enabling easy collaboration between researchers at the two facilities. “The difference between the machines is that ours has a larger bore – the hole that the patient actually goes into,” said radiology supervisor Susan Hartman, who, with five other staff technicians, is responsible for the day-to-day operation of the imaging center. 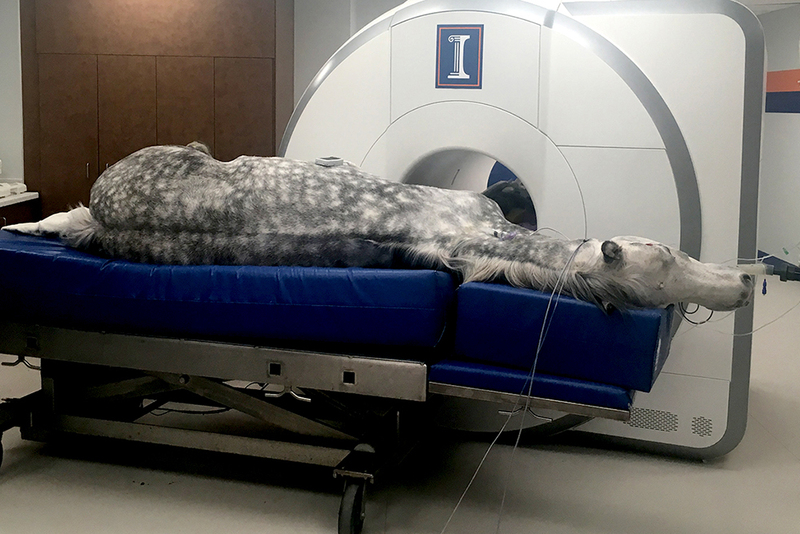 The new MRI can accommodate large animals, such as this horse, for clinical imaging. U. of I. veterinarians, including Devon Hague, anticipate many benefits of using the 3-Tesla MRI. Specifically, the scanner provides higher-resolution images and performs more quickly than previous models. “The shorter scan time is really important for our patients, since they have to be put under anesthesia for the scan and the majority of them are sick,” she said. Hague will use the new MRI to ensure the best quality of life for her clinic patients. The new scanner gives Hague and her colleagues in the neurology and neurosurgery service more accurate information to assess the prognosis of their patients and make better decisions, such as whether to operate. “The imaging can show us if a patient is likely to have a good outcome, like the ability to walk again,” Hague said. “There are big quality-of-life implications for both the pet and the pet owner. High-resolution images, like these canine patients, help clinicians diagnose, treat, and assess quality of life of sick animals. U. of I. veterinarian Ryan Fries specializes in veterinary cardiology and has training in cardiac MRI. His expertise in this field makes Illinois one of the only centers advancing veterinary cardiac MRI. With the MRI, Fries will study naturally occurring heart disease in cats and dogs and identify what predisposes certain animals to have more severe outcomes than others. Because animals develop the same heart disease as people, his work could translate to future improvements in understanding human heart disease and its treatments. “That is the most exciting part – it’s mutually beneficial. I get to treat my patients while also allowing others to gain from that information and then, hopefully, apply it to humans,” Fries said. The new MRI also will be used by U. of I. veterinarian Santiago Gutierrez-Nibeyro to diagnose and treat foot injuries in horses. Gutierrez-Nibeyro can diagnose an animal’s injury and track its recovery with the high-resolution images. The U. of I. 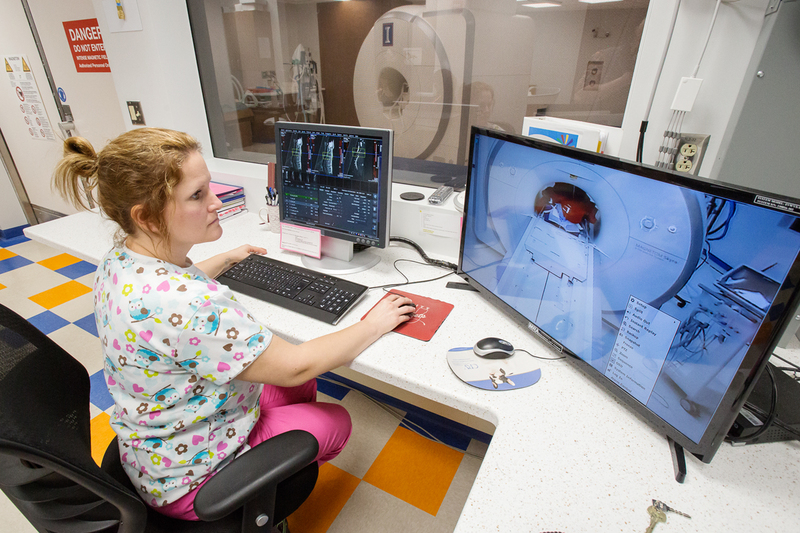 College of Veterinary Medicine technicians, anesthesiologists and veterinarians say they are prepared to take full advantage of the new MRI facility. “A lot of teamwork went into this project,” Hartman said. She expects that a lot of collaboration and innovation will follow. To reach Susan Hartman, call 217-244-2031; email shman@illinois.edu. To reach Devon Hague, email hague@illinois.edu. To reach Ryan Fries, email rfries@illinois.edu. To reach Santiago Gutierrez-Nibeyro, email sgn@illinois.edu.